Significant snow, and ice in the canyon. Look for some bigger fish in the riffles moving in to spawn here. There are not many of them here, but the few that you locate are nice grade. For the school size fish, smaller bugs like midges #16-18, PT’s #18-20, Copper John’s #18-20 are all working well. They are not selective and size matters more here than pattern. The canyon section is heavily weeded, so locate some slots or openings to get your bugs into. Light weight above your nymphs will be adequate for a good bottom bounce without getting hung up too often. Click on this link to read what the CDFW is now documenting as to how Hot Creek will be managed. HC has been recently planted with thousands of sub-catchable rainbows and browns. *Tom Loe, Doug Rodricks, and Doug Dolan are under permit from the Inyo National Forest Service to guide Hot Creek. Thanks to the CDFW, and passionate volunteers for their efforts to get fish planted in Hot Creek. 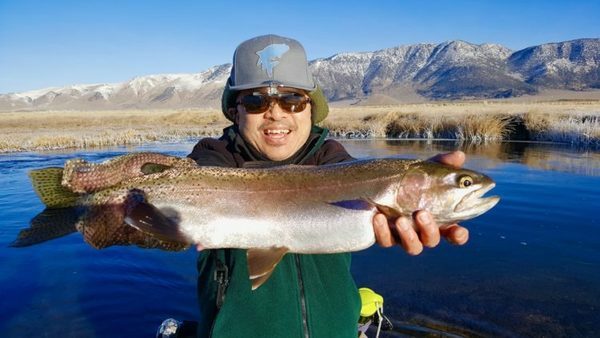 Many 8-10 inch rainbows, & thousands of 4 inch browns have just been put into HC. If we can just get some help from mother nature on the water part…HC will comeback strong next summer. These are very small fish, and will have a long winter to face. Please take it easy on them if you choose to fish HC at all. Several public sections were planted. Here I am taking a moment to watch these young fish adapt to their new home.